The Age of Enlightenment occurred during the 18th century, in the decades before the 1789 outbreak of the French Revolution. Although the Enlightenment took place many years before the outbreak of the French Revolution, its ideas and achievements still had a profound effect on the French Revolution. In fact, many historians today look back on the Enlightenment as a major cause of the revolution. The French Revolution saw the feudal society of France overthrow the absolute monarchy of Louis XVI in favor of a republic that was based on respect for individual rights of the people. The ideals of liberty and equality, that were needed to overthrow Louis XVI, emerged first from the writings of important and influential thinkers of the Age of Enlightenment. Specifically, the writings of John Locke, Jean-Jacques Rousseau and Baron de Montesquieu greatly influenced the revolutionaries in France. Each of these three Enlightenment thinkers questioned the traditional authority of an absolute monarch and argued against the rigid class divisions of feudalism, or the estates-system, present in France. 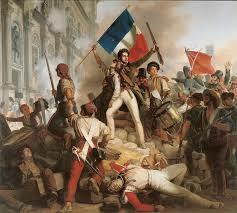 Their questioning of authority and the role of the government inspired the revolutionaries, and ordinary citizens, of France. In fact, the ideas of many Enlightenment thinkers were commonly discussed and debated in the salons of France, in which intellectuals and would gather to discuss the ideas of the day. In general, the French Revolution is often viewed today as a time when the ideas of the Enlightenment were put into action. Another impact of the Enlightenment on the French Revolution can be seen in the Declaration of the Rights of Man and of the Citizen. The document was adopted by the National Assembly on August 26th, 1789. The declaration was vitally important to the French Revolution because it directly challenged the authority of Louis XVI. For example, the Declaration of the Rights of Man and of the Citizen set out a series of individual rights protected by law. The basic principles of the declaration can be seen in the ideas and arguments of the great thinkers of the Enlightenment. As well, the declaration is considered to be one of the first documents that argued in favor of natural rights for all citizens and is seen as a major turning point in the history of the modern western world.